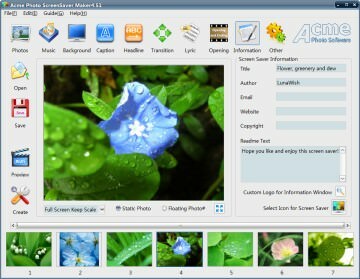 Acme Photo ScreenSaver Maker is a professional photo screen saver software. It is easy to build an excellent cool effect screen saver with your own photos and music fast. No particular skill needed, no complicated settings, whether you are a screen saver beginner or a professional, this screen saver maker of choice for you will make your screen saver software experience more rewarding. Using this tool, you can create self-install screen savers which are compatible with most Windows platform, distribute and share your screen savers with family, friends or people on the web. Try this screen saver software and have fun today! If you need more information please contact the developers of Acme Photo ScreenSaver Maker (Acme Photo Software), or check out their product website.